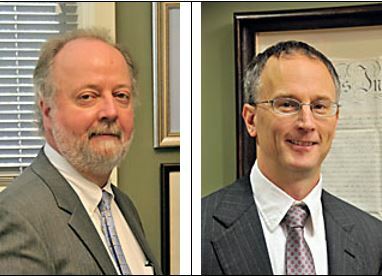 U.S. News and World Report and Best Lawyers® have announced that attorneys Kip Marshall and Greg Gregory, both shareholders in the Asheville law firm of Marshall, Roth & Gregory, PC, have been named as “Best Lawyers” in the 2019 edition of Best Lawyers in America®. Kip Marshall is recognized in the area of government relations. Greg Gregory is recognized in the field of real estate law. This is Kip Marshall’s 8th consecutive year of recognition as a Best Lawyer in government relations. His Best Lawyers® related work focuses on federal and state false claims, federal tort claims, mediation involving governmental parties, eminent domain and real estate litigation issues. Greg Gregory’s Best Lawyers® related work focuses upon residential and commercial real estate transactions, real estate development and planning and zoning issues throughout western North Carolina. The Best Lawyers® designation recognizes the top 4 percent of lawyers in the U.S. and is based entirely on peer reviews. Established in 2001, Marshall, Roth & Gregory, PC provides a broad range of legal services for individuals and small businesses. The firm’s attorneys handle complex personal injury, federal and state commercial litigation, federal and state false claims actions, federal tort claims, real estate and business transactions, real estate development, HOA disputes, construction defects, real estate litigation, trust & estate planning, estate administration, will & estate disputes, employment law/discrimination and eminent domain/land condemnation cases.